We should all be cooking and eating a lot more nettles. They are delicious, abundant and absolutely free. If this isn’t enough, nettles are also exceptionally good for you. They make a great alternative to our more familiar cultivated greens, such as spinach or kale, and can be cooked in very similar ways. I love them simply wilted, seasoned and served with butter and good-quality olive oil. February through to late April is the time to bag them. It’s the fresh, young growth you’re after. Use gloved hands to pick only the tips – the first four or six leaves on each plant; this is the most tender succulent part. Here, I’m piling them on toasted sourdough and serving them with fried line-caught pollack, wild garlic and a poached egg. It makes for the perfect late-spring supper. Wash the nettles in plenty of fresh water. Remove any tougher lower stalks; if it’s just the crown, then that’s fine. Drop the nettles into a saucepan of salted, boiling water and simmer for 2–3 minutes, until tender, then drain really well. Return the nettles to the pan, add half the butter and 1 tablespoon of the olive oil. Season well with salt and pepper, turn together and then cover and keep warm. Set a large, non-stick frying pan over a medium to high heat. Season the fish all over with salt and pepper. Heat the remaining butter and oil in the pan and when hot, add the fish, skin-side down. Cook for 3–5 minutes, depending on its thickness, then turn the fillets over and fry for 1–2 minutes until the flakes separate when pressed lightly with a fork; this indicates the fish is cooked. Ribbon (or thickly shred) the wild garlic and add it to the pan. Spoon the wild garlic through the buttery fish juices; cover and keep warm while you cook the eggs. Bring a medium-sized, high-sided saucepan of water to the boil. Twirl a spoon in the water to make a mini whirlpool. Crack the eggs in, turn the heat down to minimum and cook for 3–4 minutes. Remove the eggs carefully with a slotted spoon. Keep warm. Remember: the fresher the eggs – the better they poach. To serve, place a piece of toast on each plate. 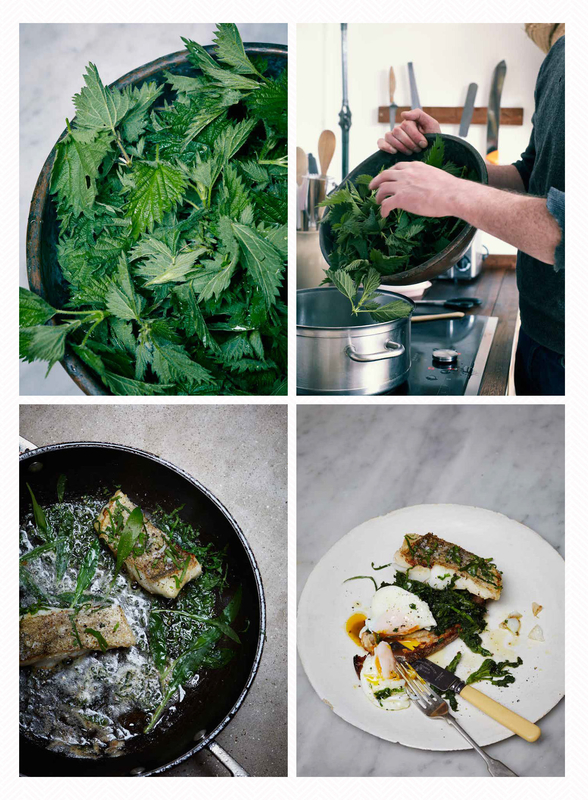 Divide the warm, buttery nettles between the plates, top with a piece of fish, followed by a poached egg, then finally spoon over the wild garlic and any buttery juices from the pan.